This is the first feature film from the then 19 year old daughter of the renowned Iranian film-maker Mohsen Makhmalbaf and wow what an opener. 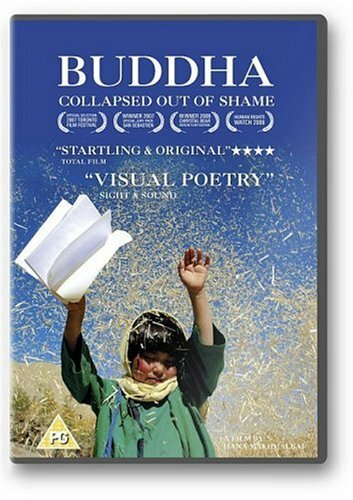 The story is set in the town of Bamian in Afghanistan where the Taliban demolished two 100 foot high, 2000 year old statues of Buddha carved into the cliff face in a wonton act of historical and cultural destruction. It tells of the perils one little girl has to face in her attempt to get to school because she wants to “learn funny stories” and her letters like Abbas, the boy next door does. Her determination in the face of everything thrown at her see her overcome poverty, indifference and violence. It is particular galling to watch how the young boys bully her, making her take part in their war games, as they mimic first the Taliban and then the Americans, ripping out pages of her notebook to make paper planes, digging her grave, putting a paper bag on her head, and taking her hostage to lure Abbas into a muddy hole. The dialog is simple and straightforward and the youngster who plays Baktay is very engaging. The viewer really empathises with her: first as she struggles to sell her eggs in order to buy the required notebook, as she ingeniously uses her mother’s lipstick when she cannot afford a pencil and how these two items get her into trouble. The perilous nature of the landscape of her walk to the market, the inherent difficulties of crossing the river to the girls’ school on the other bank are subtly handled by the young director.